First of all, With the increase of manpower and material resources in our Taiwan Office, at the beginning of Sept our Taiwan Sales branch move to a new building. We welcome more people with lofty ideals to join our team, growing up together with Kingtronics! 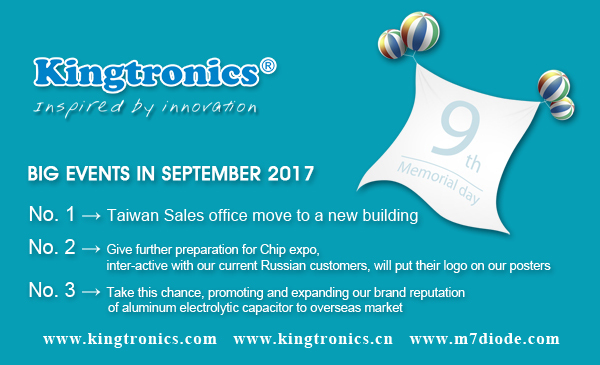 Secondly 2017 Russian chip expo exhibition in our posters, we will present the following customer's logo, this year we will bring more fresh products, brochures, gifts to our customers. Most important, 2017 we will focus on aluminum electrolytic capacitor promotion and overseas sales, we will be committed to developing more potential end customers and users worldwide, Expanding the influence of our brand. Let our distributors can win more and more orders by promoting our brand !